Interview with SOULSPIN - OOAK Exclusive! Post subject: Interview with SOULSPIN - OOAK Exclusive! Some of our members have had some very good experiences with the company, so in order to find out a little more about them, as well as giving them some well-deserved exposure, I asked them for an Interview, to which they kindly agreed! 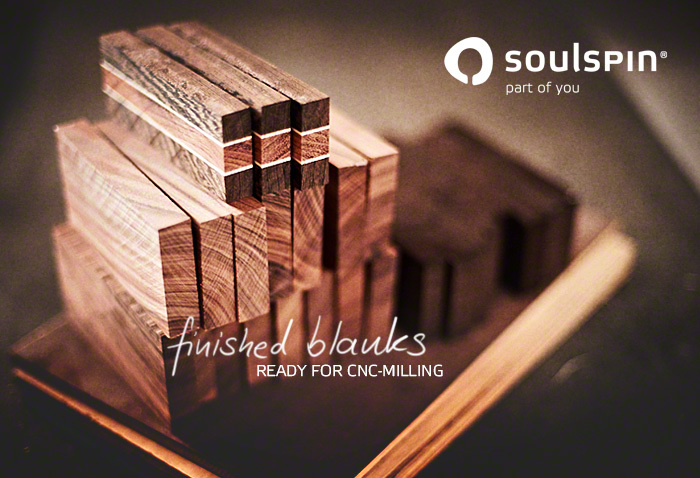 SOULSPIN: In our factory, each product is custom made- something special.Even in the manufacture of veneers, we differ from conventional production methods: we cut our veneers from natural wood. With this innovation, we are able to obtain valuable sawn veneers with properties that far outshine the previous standard. The further processing in the preparation of our high-quality plywood is done with technical expertise and modern methods, where we exploit the natural features of the various woods, and work with these to get the best possible results from the natural product in terms of its play characteristics. Our ergonomic three-dimensional handle shapes are created using the latest CNC technology.Your table tennis wood is subjected to painstaking quality control throughout, from the careful selection of the raw wood to the completion of the final product.We use only the highest quality materials, and combine advanced technology with careful craftsmanship to respond to your requirements with a top quality product. Below are the answers to all our questions, click on the pictures to zoom in for more details. I'd like to thank the team from Soulspin, particularly Anna, for the great details in the answers to our questions! haggisv:1. Do you think having a comfortable handle for the blade improves you game? Yes, we are convinced that your game can be improved be the right handle.There are a lot of good reasons, but we just want to point out a few of them. First of all it simply makes you feel much more comfortable if you have a handle that perfectly fits your hand. Some players have to deal with pain caused by sores or pressure points what can distract your concentration. Moreover it can improve the speed of your play, especially for players who tend to turn their blade a lot. Especially the asymmetrical handle designs (e.g. G3/G4 like in Basalt6 or K2) let the handle automatically "slip into the right position" while turning, because they are shaped like the inner of a hand. This makes turning a lot faster - most players who often hit the edge of the blade can reduce these problems because they are a lot faster now. Some players simply feel more safe with a handle that does not slide out of the hand. There are a lot more good reasons depending on the individual situation of a player like large hand, long fingers etc. haggisv:2. How important is the balance of a blade (e.g. top heavy). Since rubber add considerably weight to a bat, how important is it to get rubbers of the right weight, to give the bat an overall good balance? Balancing a blade is a matter of taste. Some players prefer a top-heavy blade because they like to play fast topspins ( see J.O. Waldner). Others prefer the opposite because they want their blade to feel lighter. This is the reason why we give you the possibility to choose the material for your handle. This is not only for optical reasons but also for balancing your blade. E.g. if your favorite rubber is pretty heavy and your blade feels too top-heavy you can balance your blade by choosing a material that is a little more heavy. For example a handle made of Wenge (No.1 in the configuration tool) is a little more heavy then a handle made out of Kiri (No.4 in the configuration tool) Looking at the standard handle G1 this makes a difference of ca. 6g. Additionally you can play around combining thin and thick designs what gives you even more influence on the balance of your blade. haggisv:3. How hard is it to get batches of wood that are always consistent, and of the same weight and characteristics? How do you handle variations in wood properties? Good suppliers are not easy to find. Luckily our boss works with wood since 40 years and he knows where to get good quality from. We only buy high quality wood and we check every batch. We spent a lot of time visiting wood-suppliers all over Europe to find the best ones. For our spruce-wood for example it took us a lot of time for research and traveling to different suppliers, but now we are very happy to have the very best spruce quality and it's definitely worth it. As we saw every single veneer by hand we can have a look on every piece and sort out pieces of lower quality. But we should not forget that wood is a natural product and that no tree is like the other. We choose every veneer by hand and we try to combine two pieces that fit each other perfectly relating to the weight and the natural grain of the wood. Baal:4. 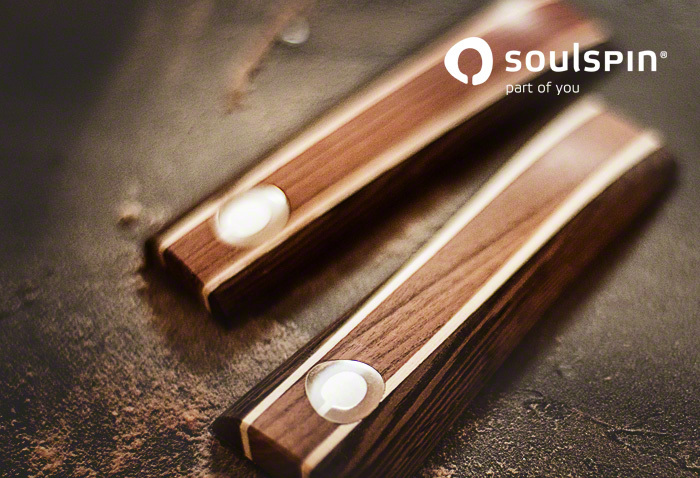 Can you tell us if Soulspin will be introducing any more composite blades in the future. The Basalt was an excellent blade, but I would like to have something more along the lines of a Butterfly Viscaria, only with the perfect Soulspin handle. Yes, we are going to add some more composite blades to shop within the next time. We can process materials like Zylon, Carbon-Aramid-Meshes etc. If you have any wishes just let us know. We can also build a composite blade for you right now, just tell us what you need. timeshift:5. By looking on your website at different blades, I can say that every blade is build with passion . how does Soulspin develop a new model of blade ? how do you test and and reach the conclusion that your " newest blade " will perform with the maximum level of speed and control , while retaining it's superb aspect and quality ? 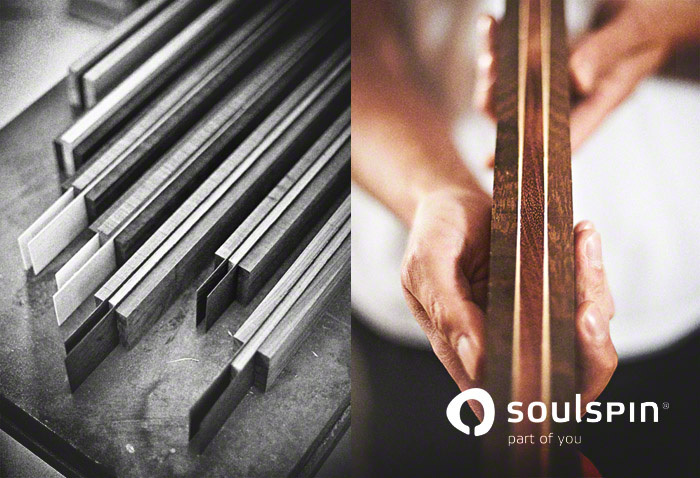 Besides SOULSPIN our boss Michael works for a chinese table tennis manufacturer since around 20 years. They develop and produce blades for all big brands like Butterfly, Nittaku, Stiga, Donic, Yasaka, Tibhar, Andro, TSP, Victas etc. As a matter of fact he has a lot of knowledge and experience in this business and he knows many of the Top 20 players. That means after having an idea for a new blade he does the first tests on his own. Afterwards he hands them out for review to different top players. timeshift:6. can we expect in the future to get the shop and the shop configerator in English any time soon ? Yes, we hope so Our configuration tool is " a very complex miracle" constructed by some tec-genius The development was very nerve-wracking as it is completely hand-made - that means providing an English version is not just translating the whole thing. But this is definitely on our To-Do list and we will try to offer at least a German/English version as soon as possible. 7. What top players have you worked with ? can you share to us some names ? Sorry, we are not allowed to give you any names because all the top players have their contracts with other tt-brands. But as I said in No.4 Michael knows many top players, especially from Germany, China, Japan and Russia. 8. 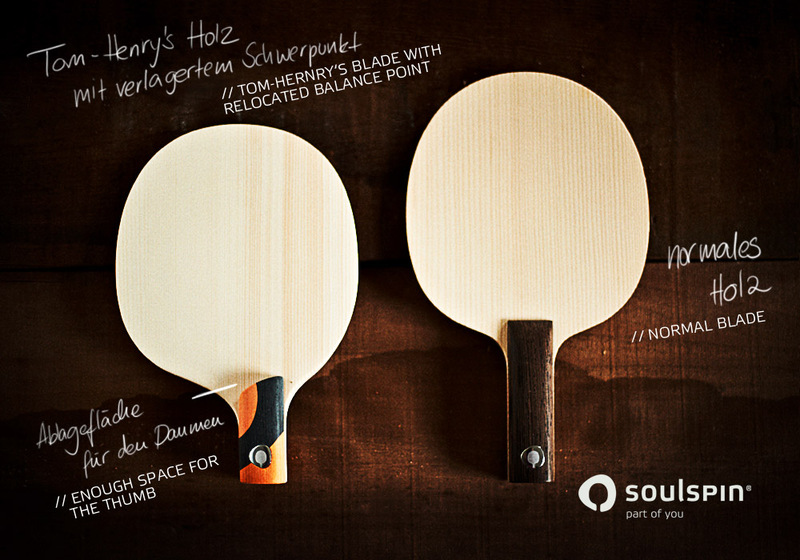 How is Soulspin encouraging the newer generation of table tennis players ? have you had the chance to support a local table tennis event in order to raise the local awareness regarding table tennis ? We support some local events and teams by sponsoring prices for small tournaments. Some months ago we supported a very popular event here in our home region. Have you heard of the world championships in 4er-Tisch (4 tables)? If not have a look at http://4er-tisch.de/ This is an initiative from some guys from a local table tennis club who worked hard for setting up this great event. The next WC will take place in France and perhaps we are going to sponsor the prices again. Second is Tom-Henry. 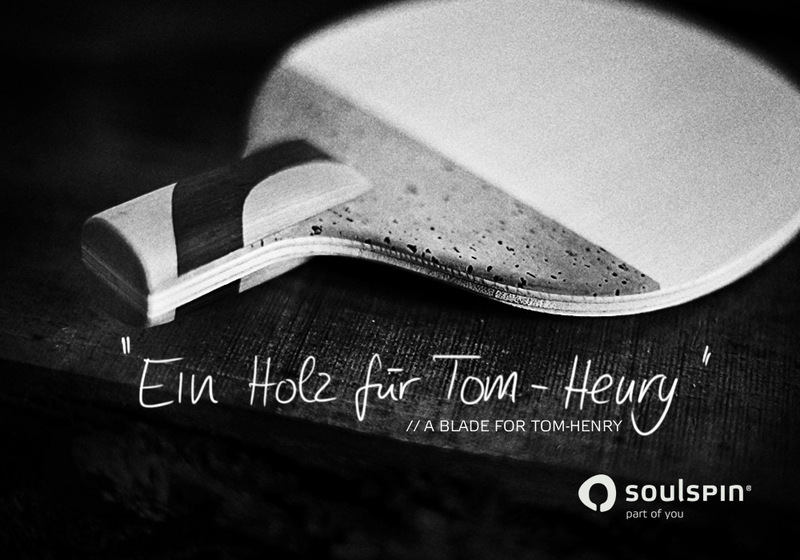 We met his father at the World Team Cup in Dortmund and he asked us if it's possible to build a special blade for his son Tom-Henry who has no fingers besides his thumb. He plays in the A-team but he has a lot of problems finding a blade he can hold good enough. Therefore we made a very special blade for him what fits his special hand. You can read the story here on our Facebook page. Unfortunately only in german again, but maybe Google translator can help. timeshift:9. 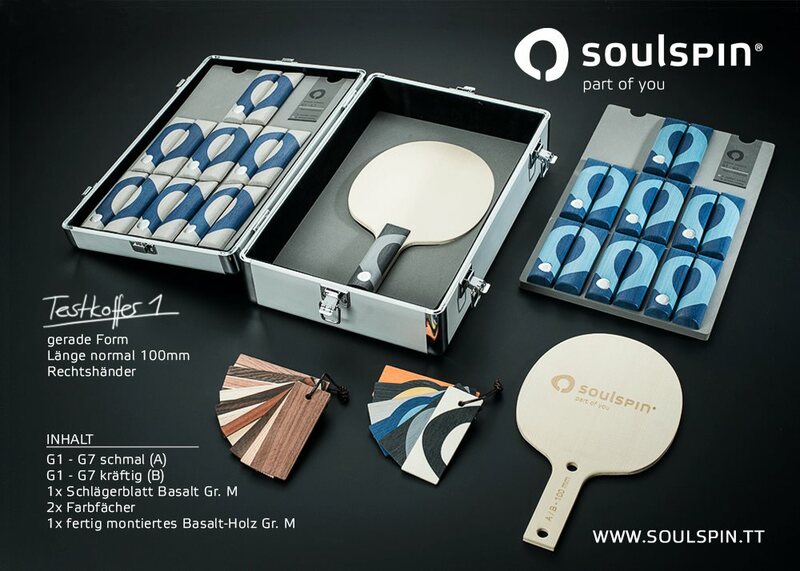 I have only heard about Soulspin recently , mainly because the market is packed with big table tennis competitors, like Butterfly, Stiga, and even big German companies like Donic, Tibhar, Andro. how do you manage to stay competitive ? SOULSPIN will stay competitive by developing and producing blades that no one of the other brands does have. As we said before Michael develops new technologies also for other brands he is always one step ahead. We have a lot of ideas and a lot of passion for table tennis. Our future goal is to expand our configuration tool to give the players even more possibilities to choose from to make their blade even more individual. We think building very unique blades of very high quality will save us a place in the market besides the big brands. timeshift:10. Are you making blades from special/exotic materials ( rare type of woods , expensive composite materials like kevlar and others ) for special edition blades ? At the moment we are not making any special edition blades, this is still too early. As I said in No.4+9 we are planning to expand the materials you can choose from. We are going to offer different kinds of composite materials but no exotic or rare types of wood. 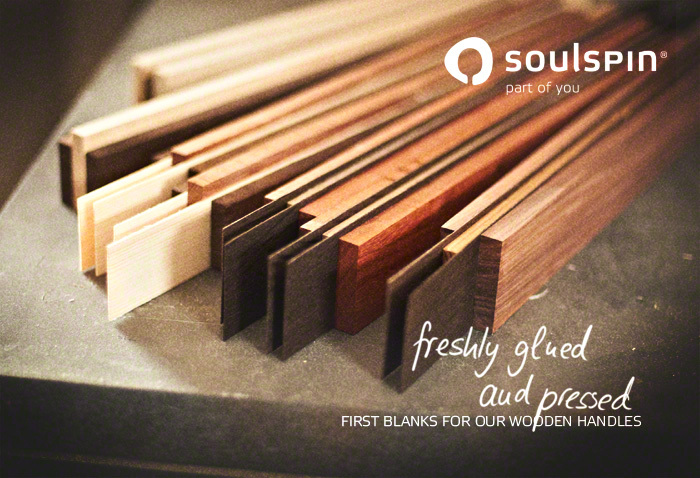 Sustainability is very important for us therefore we refuse to use rare types of wood. 11. Are most of your blades already made, and when customers order a specific handle, you make the handle and add this to the blade? No, we produce every blade when it is ordered. The basic work is done before. When we start to saw veneers in the morning we do not only saw 2 pieces but enough for the production of this day. The blanks for the handles are also prepared before as it takes a long drying period before you can work with them. When an order is placed we choose and glue the veneers and put them into a press over night. In the meantime we prepare the handles and produce them in our CNC-mill. After bringing all parts together every blade gets it's unique serial number by a laser and is shipped to the customer. haggisv:12. How much of the manufacturing is done by hand? How long does a typical blade take to make? Building a blade is a combination of manual work and high technologies like CNC milling. As I said before every single veneer is made by hand. We start with a raw piece of wood and cut it down to veneers slice by slice. The veneers are chosen and grinded by hand before we glue them together which is also done by hand. After pressing the blanks the blade is cut out by a CNC mill. The blanks for the handles are also made and glued by hand, only the cutting is done by the CNC mill. Some people criticize that we use CNC technology because they say a blade must be completely made by hand. In our eyes CNC is a great technology, it's extremely precise and we want to get the best result that is possible. We can manufacture our handles to within a hundredth of a millimetre - this reproducable precision can not be achieved by hand. Besides many people forget that constructing a handle at the computer also is a lot of handwork / brain work, as we all do this by ourselves. The next steps like gluing, grinding and polishing again is made by hand. Let's say 70% manual work, 30% made with the help of machines. Including the time a blade needs for drying etc. the complete production process takes around 40 hours. manofan:13. Are you planning to release any Defensive Blades in future? haggisv:14. Do you offer a custom design service, where players can specify the design they like? Yes, that is one of our big plans for the future. We want players to choose everything on their own. As I said above it is hard to build a platform for such an individual configuration. BUT we already build specific blades for individual players. A lot of players ask if we can change the thickness of single veneers and of course we can do so. It makes no difference for us if we cut a veneer in 0,8mm or in 1mm. If you have any special wishes just send us an email at [email protected] . We can build everything you want. One of our customers has now ordered blade No. 7 because he loves to try out different veneer combinations the effects on his game.
. Is it designed to be a direct Tenergy competitor? - if so which one - T05? Or more like a Tensor? - if so which one is closest? Yes, the P12 is a direct Tenergy competitor and can not be compared with a Tensor. It's pretty close to Tenergy 05 concerning spin, hardness and speed and it's at least a little more inexpensive. We know it is more expensive than other rubbers but we only use high quality materials and we glue every single rubber here by hand - that is the simple reason for the price level. degrees. Won't that vary depending on the sponge thickness? (if we have a choice). This is hard for us to explain in English. Your feeling does say that a thick sponge is softer than an thin sponge. But in fact the sponge material itself has one hardness no matter how thick it is. Therefore we say that our rubber has 52° hardness no matter if it is 1,8mm or 2,0mm. It is a matter of feeling. A 10cm concrete layer is as hard a 1m concrete layer. You need more power to break it, but the hardness in fact does not differ. It's the same with the sponge material. I hope you understand what we mean. 4. Any testing feedback so far? We did some personal tests and we are convinced by the results. But we still need some more time to establish that feature. 5. I've noticed that your rubber - P12 - is dual-branded under Nittaku. Is this just to avoid ITTF fees, or are you planning to come out with a set of rubbers entirely under your own brand name? We are very happy that such a well-known brand as Nittaku works together with a very small team like us. We wanted to produce a high quality rubber and for that we needed the best materials. Japanese topsheets are very well-known for their high quality. Without such a strong partner like Nittaku we would have no chance to produce a rubber of such quality. Project12 is the first product of this great cooperation and we hope that some more will follow over the years. A rubber branded entirely under SOULSPIN is not yet planned. haggisv:6. Are you planning any new rubbers in future? Yes we are planning to bring out some new rubbers together with Nittaku soon. Or better said we are planning a make-over of some existing rubbers and give them some new features. Besides we are going to produce another version of Project12 to make it more affordable for the players. Please give us a little more time. haggisv:1. Are you planning to have any distributors outside Germany? Additionally we want to start sending test-boxes around the world which can be shipped from player to player without shipping it back to Germany every time. Right now we are preparing the boxes. 2. Have you ever checked out OOAK Forum? If so, what do you think of it? Post subject: Re: Interview with SOULSPIN - OOAK Exclusive! This really makes me want to look into a Soulspin blade, especially after its been clarified that they can do their custom blades outside of the configerator tool. I'd really have to look for an excuse to need a new blade. To me, and I would imagine any potential non-German customer, one of the main problems is the German-only shop tool. The design and innovation is already there, so it's really just a few technical kinks away from expanding. Also, do I smell a possible Australian Soulspin distribution setup here? Yes I agree... adding English language can have great potential for them. Judging by the English of the Interview, they're very capable of this! They make everything look so good! Doesn't that case with the different handle options look awesome! Which Soulspin blade is recommended for blocking at the table with long pips? I understand that the sponge hardness doesn't change with thickness but the overall hardnesss (sponge + topsheet) might change becuase the thickness of the topsheet is fixed. If we have a top sheet thickness 2mm with hardness 60 and a sponge thicknesss 2mm with hardness 40, we can see that might give an overall hardness (sponge + topsheet) of about 50. If the sponge thickness is instead only 1mm then it has less influence on the the overall hardness, so it will be higher, 53 maybe. It is for that reason I asked the question and that is why I'm unsure if the overall hardness is a good measure... on its own. Yes you have a point. The answer seems to indicate that the number mainly refers to the sponge. Usually the topsheet is significantly harder than the sponge, so the measurement is mainly that of the sponge, even if the two are measured together. Soulpsin: Has there be any reviews of your p12 rubber so far? Yes, we post all reviews we receive about Project 12 or our blades on our website and on Facebook. Unfortunately this part of our website is only available in german yet We are very sorry that we can not provide 100% of soulspin.tt in english yet, but we are working on it. English speaking players can try the automatic translation by google - I think this is not that bad. If you have any questions please feel free to ask at any time! If you have any questions about SOULSPIN please feel free to ask at any time. If anyone can help translate some of the major points from the review, that would be very helpful! Sorry Spartan, we did not realize that this topic was continued - please excuse the late (very late) reply. Now we finally understood what you mean! Yes, purely mathematical you are right. Also if the hardness of the material itself is not affected by the thickness the relation between sponge and topsheet is not exactly the same - that's right. BUT in our opinion the overall hardness is still the most exact measuring method. Many rubber manufacturers measure the hardness of the sponge only and add the topsheet afterwards. This does not lead to exact measuring results. You have to keep in mind that the glue etc. also influences the hardness a lot. Therefore we think it's more precise and more meaningful for the players (and a lot of top players agree with us) to measure the complete rubber (including glue) even your objection is right. The difference in measuring between 1.8 and 2.0 is only minimal, the feeling makes the difference. Hi to all english speaking players! We finally managed to finish the english version of our website - that means our shop as well as our configuration tool are available in English from now on. We hope this will make everything a little easier for you. That's a great effort! I had a quick look, and it reads really well, well done! A few days ago we finished our first defensive blade called ROOTS Defensive Control 7. Many players asked for a defensive blade, now it's finally available. 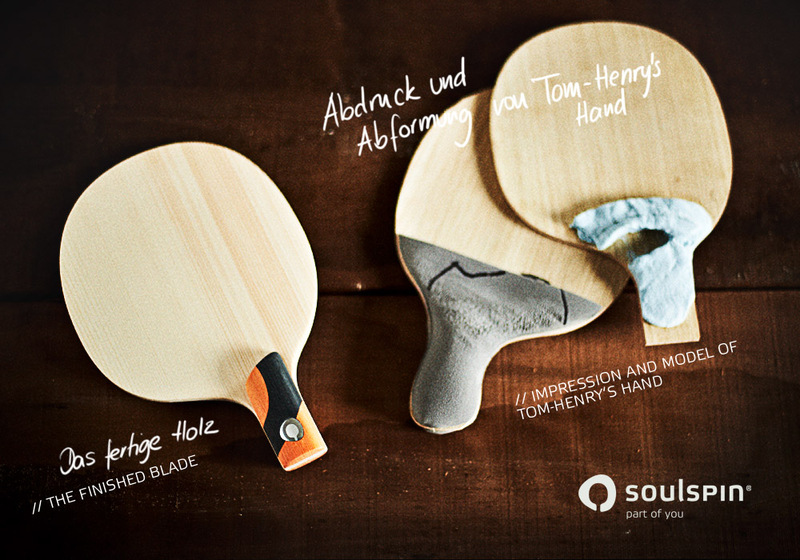 You can have a look about the characteristics here http://www.soulspin.tt/en/technology/roots-hoelzer/roots-7-defensive-control-defensive-blade.html. It's extremely soft because of thick FICHTE veneers, we are sure defensive players will like it. It's not only a new blade (e.g. wood type) but also a brand new blade size called 'DEF' . It's 156x162mm and even larger than our size 'L'. That means you can choose from 4 different sizes now. Please don't be confused - at the time moment you can not yet choose the new size and blade in the configuration tool as the implementation is a little tricky - if you want to order it, just let us know by email. Yesterday we have uploaded a printable off all 4 blade sizes to our media center. You can download it, print at 100% and you will get a 1:1 drawing of our blade sizes. Furthermore we have worked on a kind of special edition blade which is very beautiful and has some special features. It will be published as soon as we have finished all the descriptions, photos etc. And we have found a very nice new composite we will use for new blades as soon as we receive it. We hope it will not take too much time but we will keep you updated.